Like ‘im or ‘ate ‘im, ‘e’s a success! 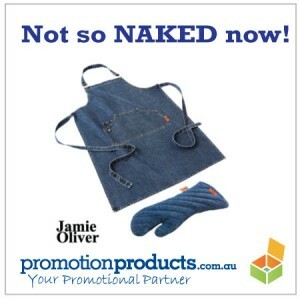 The mere fact a promotional products company includes his cookery hardware in their premium business gifts section, tells you something about the universal acceptance of his brand. Just as he recognises the link between poor diet and ill health. On the back of his success touring the US, Jamie even has his own TED talk – that’s a mark of acceptance into a level of society and cultural identity that many of our makers and shakers can only dream of. It’s worthwhile taking 15 mins to watch this video and absorb not only the message but Jamie’s influence over his audience – notice how empassioned and animated he becomes, and the reaction to him at the end of the talk – he’s a genuine leader…and inspiration. So, with such an undeniably powerful figure sweeping the globe educating masses on nutrition and the benefits of healthy eating, it’s only understandable that the big corporations have jumped on the bandwagon and used him to their end. And you can too. The Jamie Oliver Apron and Kitchen Glove Set is fully brandable with your logo or message and by giving this as a premium business gift, you are not only delivering a high quality reminder of your business relationship but are buying into the man, his attractive global brand and a movement that could save lives. This entry was posted in business gifts, Fun and Leisure, hospitality clothing, Outdoor Products and tagged catering, clothing, outdoors, restaurant by admin. Bookmark the permalink.